Japan is rich with giant trees. The largest is Jomon Sugi – giant cryptomeria in the mountains of the small Yakushima (Yaku Island). 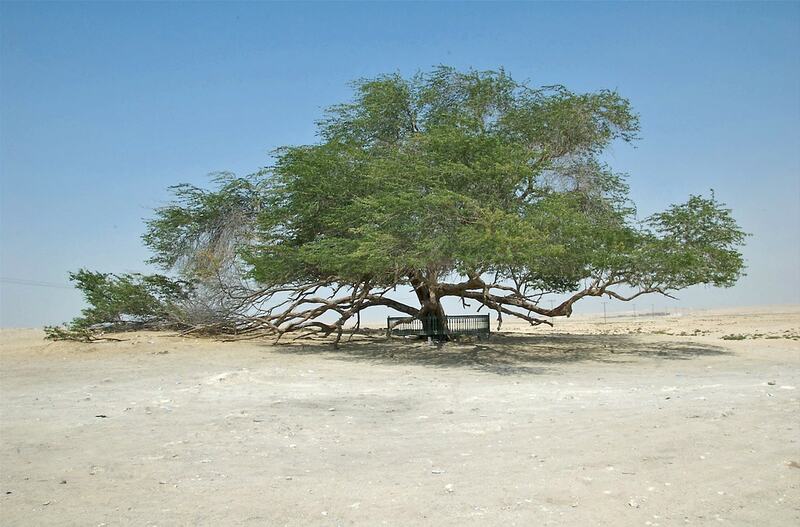 It is estimated that this tree is more than 3,000 years old although some believe that it could be even 7,200 years old. Yakushima in some aspects is like a small version of Japan: central part of the island is "left" for pristine nature while the rims are densely inhabited by hard working people, who are developing ambitious high-tech projects, e.g. hydrogen fuel cells fo the future "Honda" vehicles. Forest in the central part of island is unique. Here grow 1,900 species of plants, at least 94 of these are found only here. Plant life has evolved on a nutrient poor soil, often there is just thin layer of soil on hard granite. Altitude zones of vegetation are well expressed: tourists can enjoy subtropical vegetation at the sea level, then comes zone of laurel forest, zone of cryptomeria forest and finally – alpine vegetation around the 1,925 m high summit of Miyanouradake – the tallest mountain in this part of Japan. Especially impressive is the cryptomeria forest at the height of some 800 – 1,600 m above the sea level. This forest is covered in eternal mist, precipitation here may reach 10,000 mm per year. Yakushima is the rainiest place in Japan. Fog, giant trees and eerie green light create a feel of fairy tale forest: and this has been used with much success. Depiction of Yakushima forest plays a significant role in one of the greatest anime movies: "Princess Mononoke", it served as an inspiration for the forest of spirits. Largest trees in this moss covered forest are millenia old cryptomerias. Cryptomeria (sugi) is a genus of conifers, which includes just one species – Cryptomeria japonica – beautiful, noble tree, which, reportedly, can grow up to 70 m tall. This tree is endemic to Japan, although it is cultivated in China for millenia. Yakushima happens to have some of the best sugi trees. Thanks to constant moisture trees have much resin and wood is resistant to rot. For centuries island has provided top quality wood for the construction of temples and ships. Thus, one of the largest known cryptomerias was cut in 1586 and its stump stands in the forest up to this day. It is named Wilson stump after an English plant collector, its circumference at the base is 32 m, diameter at the height of chest – 4.39 m. Now it is hollow and groups of tourists may enter it. Cryptomerias which are older than 1,000 years, are named yakusugi. Many yakusugi have their own names, e.g. Kigen Sugi – 2,500 – 3,000 years old giant with a circumference of 13.3 m. Some more yakusugi are Daio Sugi (circumference – 11.1 m), Ryuujin Sugi (11.0 m), Meoto Sugi (10,9 m, two trees grown together with a small stream flowing between them), Kawakami Sugi, Buddha Sugi, Futago Sugi, Sennen Sugi and many more. 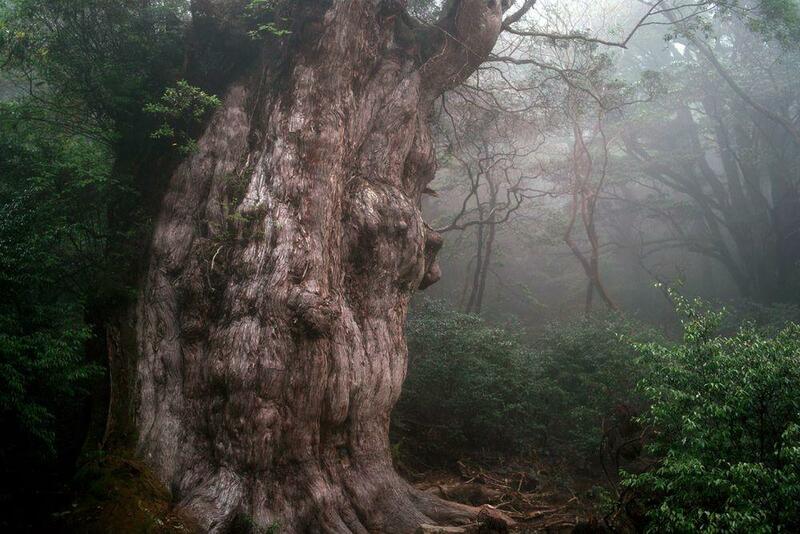 Jomon Sugi – the largest tree of this fairy tale forest – most likely was known to locals for centuries. Wider society learned about this tree from publications in 1968, after Teiji Iwakawa found the tree in 1966. Initially the tree was named Ohiwa Sugi – but soon after it was renamed to Jomon Sugi. Jōmon ("rope patterned") symbolically links the age of this tree to the prehistoric times of Japan – Jōmon period, which in turn was named after the cord-marks, characteristic for the ceramics of Japanese prehistory. Tourists rushed to the island to see this beautiful tree in fairy tale forest. 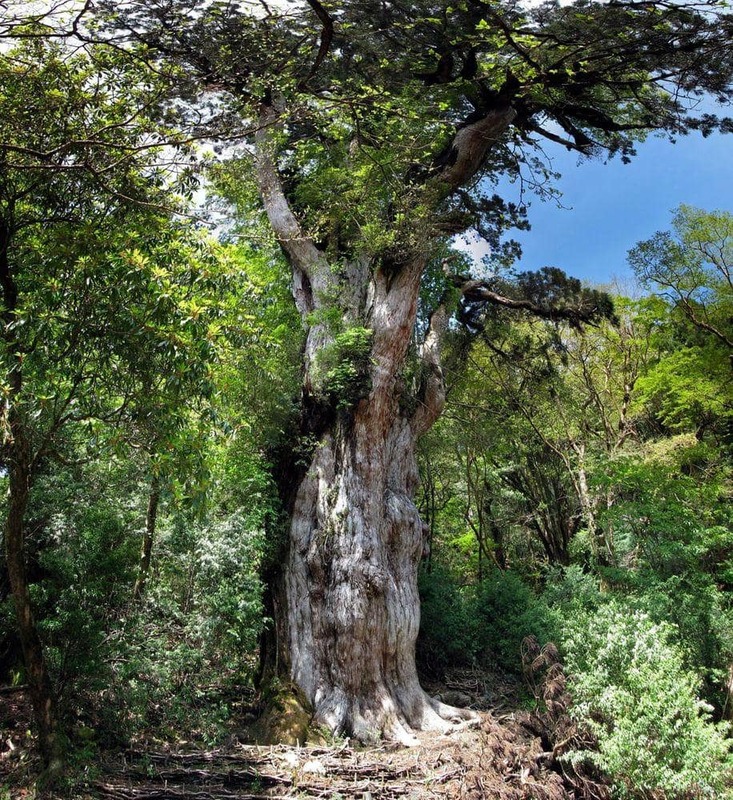 In fact the tree was one of major reasons to protect the unique forest of Yaku Island, which in 1993 was included in UNESCO World Heritage list. Two nature routes – Kusugawa Hiking Path and the Arakawa Trail – pass now along the tree. The walk requires 4 – 5 hours from the nearest road. Tourists are not allowed to walk at the tree: there is built an observation deck some 15 m from it in 1996. Most people come in May – August, but experienced travellers advise to come here in the late autumn, when one can feel more intimate with this fabulous forest. At the breast height the tree has a circumference of 16.4 m (some earlier sources give 16.2 m but it is possible that tree has grown a bit larger now). It is 25.3 m high and has a volume of some 300 m³. There are taller and stouter trees in Japan, but Jomon Sugi is the largest one. Most likely Jomon Sugi is the oldest tree in the forest and one of the oldest in the world. There are different estimates of its age: between 2,170 and 7,200 years. Scientific analysis shows that it is certainly older than 2,000 years and, most likely – older than 3,000 years. Centre of the trunk has rotten, thus we can not find exact age by counting tree rings. It can not be older than 6,3 – 7,3 thousands of years, when catastrophic eruption eliminated most of vegetation in this area. Those who have seen Jomon Sugi in nature attest, that the tree on images looks very small if compared to real life experience. No images can transfer the magnificence of this great monument of nature. Kinkaku-ji / Laitche, Wikimedia Commons, public domain. 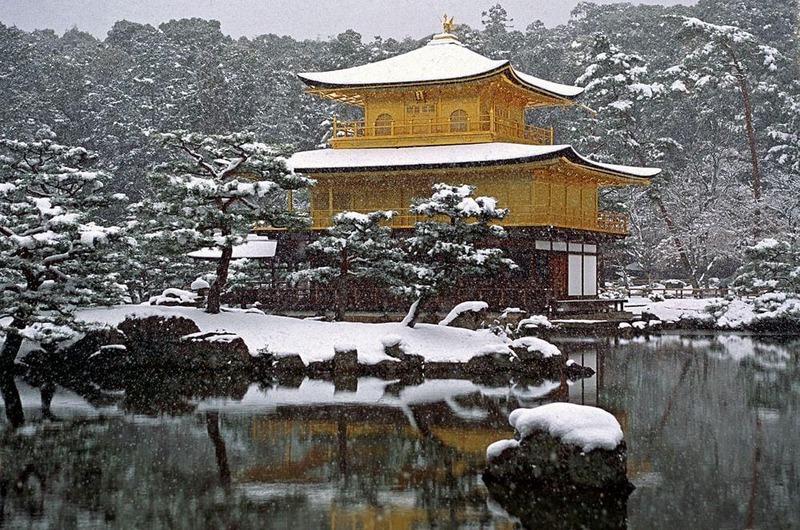 There are few countries in the world with such distinct and rich cultural heritage as Japan. One of the greatest achievements of Japanese culture is that Japanese have reached certain harmony with nature and every notable natural landmark in the country is part of Japanese culture. This English translation of a key work by one of Okinawa’s most respected historians, Mamoru Akamine, provides a compelling new picture of the role played by the Ryukyu Kingdom in the history of East Asia. Okinawa Island, from which the present-day Japanese prefecture derives its name, is the largest of the Ryukyu Islands, an archipelago that stretches between Japan and Taiwan.